Bargain Balloons. Discount Party Balloons. We offer over 2,200 balloon related products including foil party balloons, latex party balloons and balloon accessories. Please check out our new foil party balloon catalog version. This is a version of our online store where you can browse the entire catalog in less than 10 pages allowing you to place your orders quicker. recommended for high speed internet users. A balloon is a flexible bag filled with gas which in the case of party balloons is typically either air or helium. Helium is lighter than air. Because it is lighter than air a party balloon filled with helium floats. However, over time the smaller helium molecules escapes through the membrane of the party balloon and the balloon eventually looks deflated and will fall to ground. Today's party balloons are made mostly with natural latex or foil, but other types of balloons do exist which are made of rubber or polychloroprene. Foil party balloons are sometimes called mylar balloons or metallic balloons. We sell over 2,000 designs of foil party balloons and 200 designs of latex party balloons. 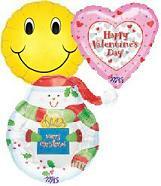 We offer one of the widest selections of party balloons found online. We will be adding more designs over the next few months. 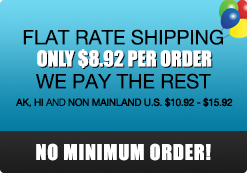 Our prices are 20-60% off normal wholesale everyday. We look forward to shipping you your first party balloon order. If you have any questions related to balloons please do not hesitate to e-mail us by press the mail icon below. Email us at with your questions, comments and/or special requests. E-mails are answered throughout he day including weekends and holidays.